I couldn’t help but notice how my son Justin had a very good disposition the whole day yesterday. He woke up with a smile on his face and said, “Mommy.” When he left the bedroom and saw Manang, his yaya, he said “Hi, Manang. Good morning.” Of course, that endearing comment made his yaya’s day. He went doing his activities for the day with nary a fuss. He even sang while he played. In fact, he didn’t cry the whole day. Hmmm. This left me wondering. What could have possibly triggered such a pleasant behavior? Let me think. We didn’t go out last Sunday. We never had anything new or special in the house, just the usual fare. But we had visitors. Justin’s Tito O. (short for Tito Orlan) and Tita Meme paid him a visit, and that could have made his day. You see, he adores his Tito O. The last time we slept over at Tito O. and Tita Meme’s house, Justin played “throw and catch ball” with Tito O. He enjoyed it that much that he couldn’t forget it. Justin would often ask me to call Tito O. to remind him of the ball they used when they played. And since they (Tito O. and Tita Meme) own a car and when we (Justin and Mommy) would go to the back of the building where we live to watch cars passing by, Justin would often exclaim “Car Tito O.!Car Tito O.!” when he’d see something similar to Tito O.’s car. I guess that explains it. 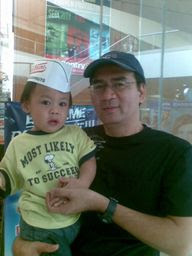 Justin was happy seeing his current favorite tito. And he carried that gladness in his heart from Sunday afternoon until last night. What a sweet boy! I hope everyday would be like yesterday. This entry was posted in Anecdotes, Humor. Bookmark the permalink.